Keynote Discussion video, audio and photos now available: click here. The video is available as a torrent for download. To download, you will need Azureus, BitTorrent, or similar. Many thanks to Peter J Bentley for providing the audio file, and to UCL for hosting it. Video of the event will be posted when editing is complete. 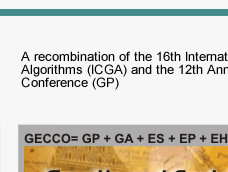 SIGEVOlution, the newsletter of the ACM Special Interest Group on Genetic and Evolutionary Computation (SIGEVO) is available online. GECCO "Job Shop": GECCO will host a special Monday lunchtime session for participants looking for positions in academia or in industry, and for employers looking to hire. Bring copies of your resume, publications, and job descriptions and show up for brief 1-on-1 meetings on the 6th floor Malet Place (room 6.12a and 6.25) on Monday 12:30pm-2pm. No advance scheduling required. 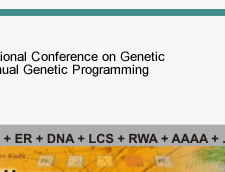 The Genetic and Evolutionary Computation Conference (GECCO-2007) will present the latest high-quality results in the growing field of genetic and evolutionary computation. Topics include: genetic algorithms, genetic programming, evolution strategies, evolutionary programming, real-world applications, learning classifier systems and other genetics-based machine learning, evolvable hardware, artificial life, adaptive behavior, ant colony optimization, swarm intelligence, biological applications, evolutionary robotics, coevolution, artificial immune systems, and more.